We have big differences with the Assad regime. The recent report will strengthen Assad’s position that the fate of the regime should be decided by coming elections, not foreign military intervention. The recent spike in Assad’s popularity will also lead the West will increase the tempo of its efforts to oust the regime. It is clear that the fall of the regime would lead to a weakening of the region’s ability to resist Western imperialism. 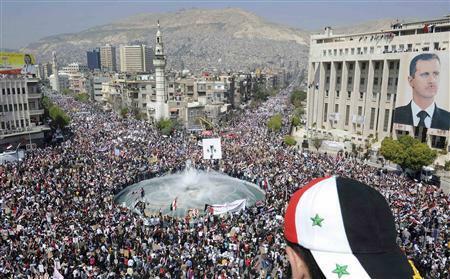 The fall of the Assad regime would mean the strengthening of the Gulf States, Israel, Turkey, Jordan, etc. It would mean a weakening of Iran, Hezbollah, etc. Although Russian imperialists have come to the aid of Assad, in our calculations they are far less a threat to the region than the more powerful Western imperialists. Plus, it is almost certain that if push came to shove, Russia would not commit its military to defend Assad even if NATO did so. In our calculations, imperialism as a whole is strengthened by the success of the West in Syria. Defending Syria against Western intervention is the duty of all people of good conscience. Uphold the United Front Against Imperialism! Hold the Red Flag High!